Who do you think you are fooling???? COATIMOM!!! This is a huge waste of $40.00 and Coati Daddy told you so before you bought it…..The Puppy won’t use it and us Coatikids are laughing at the thought LOLOLOLOLOL! 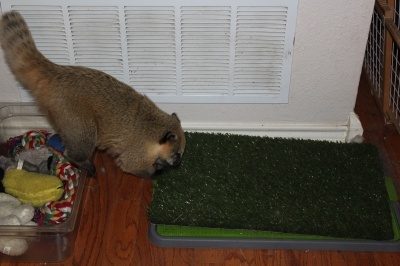 Potty Patch Indeed!, more like astro turf on a plastic tray…. Yeppers…that made me giggle too! What do I know I’m just a puppy..Woof Woof! Previous Previous post: Whatchoo talkin bout? Next Next post: A Little Afternoon Delight!